Publisher : Leadstart Publishing Pvt. Ltd. Author Background - The heart can be dissected, the brain can be spliced open, but I love to unravel the mind and emotions. Dr. Shinde Sweety holds a doctorate in medicine. Avid Mahabharata fan. voracious reader. Yoga enthusiast, student of Spanish and yearns to learn Sanskrit. Skilled at pencil sketch. Loves to swim. Curious about the mystic and mystique. Insane about soulful music. Content to be cocooned in a dream world. Blurb - I knew there was nothing poetic about death. I knew not that the most horrific battles are fought off the battlefield. Arjun the idealist in a non-ideal world, the warrior whose deadliest opponent was his conscience. History forgot his voice, but misquoted his silence. My self esteem originates from me and ends in me. Why does your honor depend on me? Find your own. Draupadi the untamed tigress, the fragrant flame, the unbridled spirit. Power does not justify sin. Power is not virtue. Virtue is that which lasts in spite of power. Krishn the enigma whose unique ideology churned the battlefield into a quest for truth. The missile the trajectory the vision. The trio that makes for the core of the Mahabharata (Indian epic). Review - Indian mythology fascinates me a lot, from my childhood I used to be really attracted towards the characters and the stories. I always believe people don't carry the story with them but the characters. The greatest stories are the ones in which people could identify with the characters the most. In Indian mythology the characters are really strong and carry multiple dimensions. They are far beyond the concept of the modern day writers. So, when you write taking into account the characters of Epic Mahabharata then you have already given yourself a lot to deal with. Though these days I hardly review books due to shortage of time but I couldn't afford to miss this one. I have been a reader of the author's blog and hence my curiosity for the book was even higher. As I started reading reading the book, I felt the author did a lot of hard work. When you write a novel, people hardly have any expectations from you but when you are writing about the characters which people have read throughout their lives then the expectations are really higher. In first few pages only the author will capture your imagination. As said the book gives some really beautiful insights. 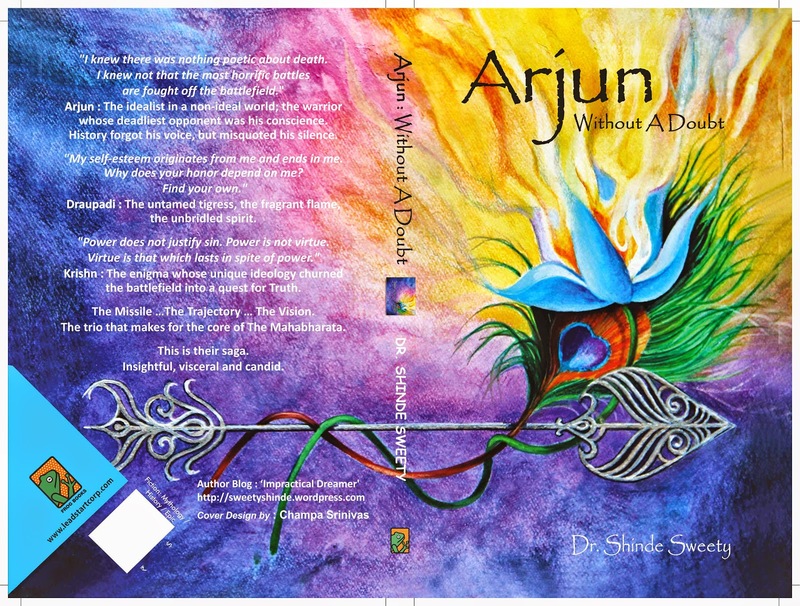 The narration from Arjun's point of view will make you feel more close to the story and the people who feel bore reading mythologies will love to read it like a drama/romantic story. The book have the narration from Arjun as well as Draupadi's point of view alternatively. According to the author "the story needs 2 voices. This is b'cos whenever Arjun is away on his voyages, Draupadi is the alternate narrator for events happening at non-Arjun events. "She further states " Draupadi is inclusive in the name Arjun. She along with Arjun & Krishn forms the 3 Krishnas of Mahabharata." Draupadi's character was the best in this interpretation of Mahabharata. Her one side as a lover of Arjun and another side as virtuous princess and then queen of Indraprastha was beautifully dealt with. And just a few lines later you can witness a different Draupadi. Another diversion that people may find will be Arjun's thought's about his brother Yudhisthir. He shifted the whole blame of the dice game to him, which I think should go to all of them equally but as the book is from the point of view of Arjun and hence it would be state his own perceptions of the events. Verdict - The book is highly recommended to people of all age brackets. I think it's always good to read about the characters of Mahabharata, there is so much to learn from the story and the characters that it is always an enriching experience. The book will give you deeper insight of how Arjuna and Draupadi felt during the various events of Mahabharata. The story telling is good and it has some wonderful quotes which will stay with you forever. Rating - 4 and Half stars out of five. A very well written review. The character of Draupadi has always fascinated me and the bond between Arjun and Lord Krishna is really close to my heart. It is considered bad manners to respond personally to a reviewer, but then ...rules are made to be broken! I'll take the opportunity to state that karn's infamous ouster is an interpolation as per critical editions like BORI, Geeta Press and Neelkanth, but has been cemented in public memory due to TV serials. I merely dealt with it from logical point of view, which I again clarified with references in 'Exploring myths' chapter. I got similar feedback from a few other reviewers, so I'm aware that I'm battling years of prejudice. However, I don't see why Draupadi has to bear the cross of karn's failure. But once again, thank you for highlighting the character facets you discovered through their individual speech. A writer loves to have a reviewer explore their writing. I'm glad my book is passing across safe, discerning and able hands. Thank you very much.